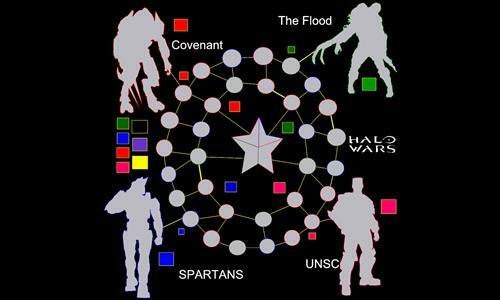 This map was inspired by the Xbox Frenchise Halo games and mostly the Halo Books. All planets were named after real planets in the book. Took lots of reading to accomplish, but the books are great, had fun reading. Review by Nathan on 10/3/2013. This would make a nice 4-player map, both pvp and pve, if you designed some scenarios and balanced the bonuses in the 4 "character" territories. I did so myself by setting them all at 8 armies (the lower of the two settings) and by requiring all players to start on a character territory. The result was a nice little ring-around-the-rosy game in which I conceded the center but captured the character territories in sequence. Review by tayloj on 9/20/2013. The custom scenarios didn't work, actually they didn't even come with the map when it got public. I'll make a new version, well balanced, and hopefully the scenarios will work. I noticed the two top characters had 13 armied per turn without the scenario, the two at the bottom had to be team and the two on top separated. That was the scenario, but it doesn't work. I hope next version will work out. Thanks. Review by David Rader on 9/25/2013. Review by DanWL on 10/14/2013. Review by Mightymino on 8/31/2014. Review by Andalorium on 1/30/2017. Decent map, yes balance wise it could be improved, but still a challenge as is and still fun.